"ARA President Doug Reinert and First Vice President Randy Reitman both attended the recent Third Annual Car-Part.com Industry Conference that was held in Cincinnati, OH. As Doug put it, "there was something to be learned by everyone, no matter what size business they had," seconded by Randy and, judging by the enthusiasm exhibited by other attendees, including recyclers from Australia, all came away fired up about the improvements and changes unveiled over the three days." Click here to read the full article from Locator UpFront. Car-Part.com is the first company to help auto recyclers sell parts on the Internet by adding inventory to their web sites. Car-part.com software allows easy uploads of inventory from Pinnacle, Hollander®#, Checkmate®, Classic and Checkmate®, Jr. Joining forces with specialized networks is another strategy for boosting the odds for success, says Shannon Nordstrom. His companies site, for example, participates in the United Recyclers Group website, the EDEN Exchange, and Car-Part.com. Car-Part.com, which now boasts an inventory of some 4 million parts, was the first Internet site dedicated to the automotive recycling industry. Launched in May 1998, the site now offers for sale the inventories of more than 150 recyclers. Car-Part.com offers more information to the customer than was available before, which makes it a more useful tool, says president Jeffery Schroder. If you are looking for a way to add value to your inventory, this is it. Schroders company originally hosted websites for distinguished corporate clients such as the United Nations and Sesame Street. But, with a brother in the recycling business, Schroder got interested in the industrys e-commerce possibilities. Existing trading systems like ADP-Hollander®# were limited to recyclers, he explains. It seemed that a more open system that gave access to consumers and other interested businesses would be a benefit. Schroder was so convinced that he gave up his other corporate clients to concentrate his website company and the expertise of its 14 employees on the automotive recycling industry. Recyclers get a website hosted by Car-Part.com, and their inventory is listed in the Car-Part.com inventory, with a link back to the dealers website. Anyone with access to the Internet can search Car-part.com's inventory. Its a simple concept, and the webpages are not fancy. But it works: Car-Part.com racks up some 400,000 visitors a month and 110,000 part searches. The Internet solves some of the problems associated with recycled parts. Giving repair professionals a better selection of recycled parts can increase their use. If a Web site provided 100 Ford Taurus doors, each with different characteristics (condition, location, delivery options, and price) the repair professional can choose the match that best fits their need. This dynamic pricing model is sweeping the Internet. The condition of recycled parts is very important because the time to repair can make the difference between a good value or a bad value (vs. a new OEM or aftermarket). It is very important that damage estimates by recyclers are accurate. Two recycling organizations have relevant damage standards. Automotive Recyclers Association (ARA) has damage codes that define where the damage is and the United Recyclers Group (URG) defines each credit card size worth of damage to be equivalent to one hour of repair. Like many solutions in the auto recycling industry, Car-Part.com started with an auto recycling family solving a problem no one else seemed interested in solving. In 1996, Foreign Auto Salvage wanted to improve upon their Checkmate®/Orion® Experience. It appeared over time the inventory management system would improve either through URG's work or through the Checkmate® division of ADP(after a spin off from antitrust concerns). The parts locating systems had 3 weaknesses. First, major buyers such as body shops and repair facilities were excluded from the parts locating systems. Second, auto recyclers could only locate from facilities using the same inventory management system and not from their natural business partners. Third, because the systems were telephone (and satellite) based and required long distance phone calls, they were too expensive. An internet based parts locating system could improve the proprietary experience and greatly expand the auto recycling market as a whole. 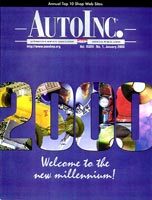 Car-Part.com went live in May of 1998 with auto recycler inventory on the web. Being the first company to offer the service to auto recyclers was just the beginning. 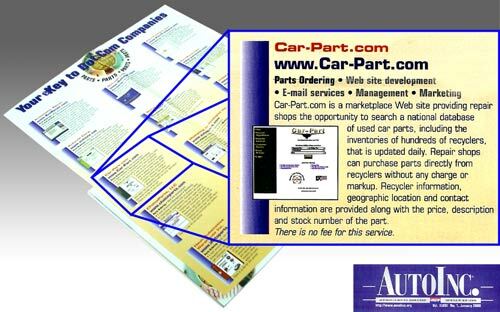 Car-Part.com went live in May of 1998 with auto recycler inventory on the web. Being the first company to offer the service to auto recyclers was just the beginning. Car-Part.com currently supports Pinnacle, Hollander®#, Powerlink, Classic, Checkmate® and Checkmate® Jr. parts data and is currently working on Fast Parts Support. It was clear from the beginning that Interchange based searching would be a major benefit. We have been negotiating an Interchange license for over two years now and are told we are close to having one. By leveraging their offline brands, auto recyclers can easily establish their online website and offer repair shops the convenience of 24 hour parts procurement. Leveraging the recognition of state associations, recyclers can gain further parts exposure by pooling their data onto the state association website (for example ARANY.com). Auto recyclers can also pool their data together with trading partners and co-market consolidated sites to insurance companies and repair shops. The Car-Part.com website markets the parts of 200 auto recyclers with a nationwide print campaign and an online campaign as well. We can grow the recycled parts market by giving repair shops the ability to find the recycled part that best fit their needs. The "best' part depends on many factors including condition, location, availability, brand, and price. Empowering your customers leads to greater loyalty and customer satisfaction. It's no surprise, 11% of recycled parts are expected to be purchased via the internet next year.